Since the introduction of WebViewer, Google Maps were quite popular in FileMaker solutions. What many FileMaker developers may have missed though is that in most cases they were using Google Maps API illegally and Google could ban their API key or IP address from accessing the feature at any time. 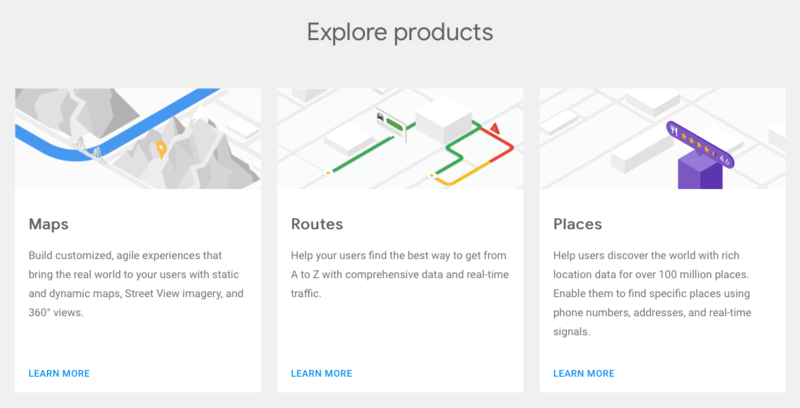 Google was offering two pricing plans for using Google Maps APIs, called Standard and Premium. The Standard Plan allowed the APIs to be used for free until you reached certain limits. What many people did not notice though was that officially, the only way to use Google Maps API under the Standard Plan was to use it in non-commercial publicly accessible websites and apps that did not track assets. Pricing for the Premium Plan was not publicly available. You had to contact Google or their partners to get the pricing. They knew why. The minimum price was the Premium Plan was set to 8580 EUR per year at the time we were checking it (March 2016). You could get a developer account for less (2145 EUR) but were not allowed to use it in production environment. Practically, Google was allowing people to use the API for free within the Standard Plan. You could easily create an account and request an API key, and it just worked. But they were monitoring the number of API calls per account and when you exceeded certain limit (much lower than the Standard Plan usage limits) it triggered their check whether your use may fit in one of the conditions requiring Premium. If it did, they typically either contacted you with an offer for Premium, or banned your account, or both, depending on how much you used the API. We discovered this when our app, still under development, stopped working without us changing anything. If this happened to you when your app was deployed and used on a daily basis, it could generate a great amount of pressure for you to simply go and pay Google huge amount of money just to get your app back up and working. This aggressive and unfriendly licensing, absolutely unsuitable for small businesses, helped a lot of alternative providers, such as Graphhopper, to build user base on providing similar (or even better) services for much lower price. Actually, we decided to go with Graphhopper as in addition to paying 10 times less we got an easier to use and better documented API. That all belongs to the past now. If it’s not too late. Google seems to have finally figured out that the train was rushing away, leaving them behind, and decided to try to catch up and survive. Or not. Who knows? Time will show. On July 16th, 2018, new pricing becomes available and the APIs, now called “Google Maps Platform“, will be billed differently. Besides changing the pricing of individual services, Google is making two huge changes in the requirements. Google is closing and locking the door. The door is closing on the June 11th, 2018. Starting from that date, all Google Maps Platform API requests will have to include an API key. All keyless access calls will fail with an error. The door is finally locking on the July 16th. From that point, Google will require every API key to have billing enabled. In plain English, if Google does not have your credit card number, your API key will start failing on the July 16th, 2018. It may seem like a simple protection against people exceeding their limits and than failing to pay, but in reality, this will make it extremely easy for Google to charge more for whatever API call they find important or popular enough. Even decreasing or removing that free $200 monthly credit will be just a matter of pressing a button. For a Google’s shareholder, this seems like a good reason to keep or buy GOOG until July 15. For every Google Maps user it’s a good reason to check the API calls now, and if anything stops working on Monday, the 11th of July, hurry up to either fix or replace it before the door gets finally locked! You may just need to enable billing and all will be good. All product changes will be will be available to try, free of charge, between June 11th and July 16th, and the supposed cost will be shown in your account so you should be able to easily predict what Google Maps will cost you under the new pricing. If it’s too much, you may want to look for alternatives. In that case, starting with Graphhopper is definitely not a bad choice. Only time will show whether the good outweighs the bad. But it seems obvious that the trend of big companies wanting our credit card numbers and charging at least small fee for their originally free services is irreversible. In any case, for us, consultants and custom app developers, it is good and important to know the current rules and be sufficiently informed to properly advise our customers.